My little Lucy loves unicorns. I'm not really sure when it started or where it came from but lately she has been obsessed. The only thing she told us that she wanted for Christmas was a unicorn. 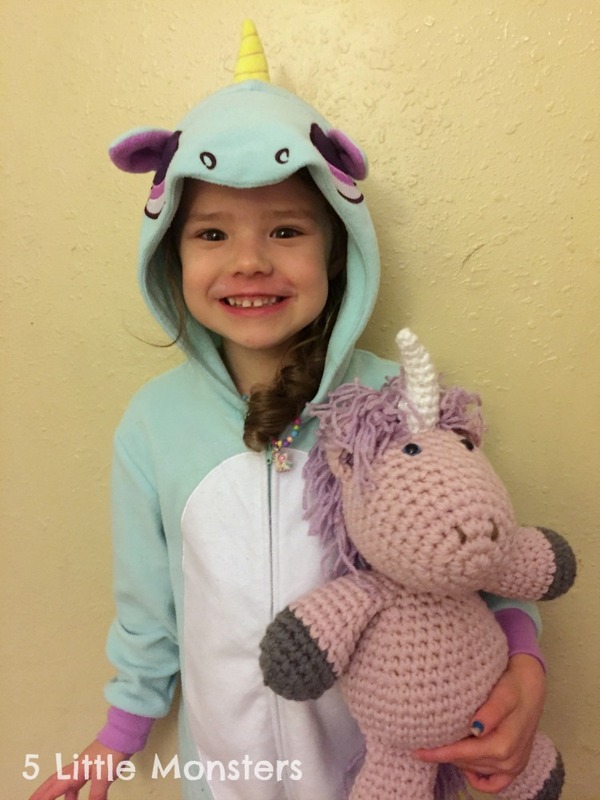 She ended up with some unicorn toys, unicorn pajamas, and a unicorn book. A few days before Christmas I was looking at my yarn wanting to make something, not that I didn't have projects I needed to work on, I just wanted to make something just to make it. 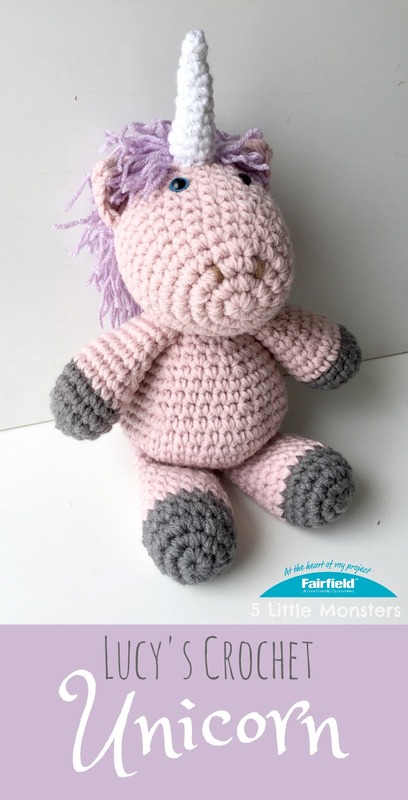 I saw some pink yarn that I had left from a couple of other projects (I used it for Mary's shawl in my nativity and for a little clutch that I made that combined sewing and crochet) and the thought popped into my head that Lucy would love a pink unicorn. I wanted it to be pretty big but Christmas was only a few days away so I needed to be able to make it quick. I decided to double up my yarn and use a bigger hook and it worked great, that is until I ran out of pink yarn when I only had a couple rows left of the last leg. It was JoAnn's Big Twist yarn so I could only get it there. I ended up having to drive all over the valley to find a store that had some in stock but I was so close to finishing that I was determined to find it. Luckily I did and I was able to finish it before Christmas. She loved it and seeing her face was totally worth the drive to find the yarn. Of course, now instead of getting rid of some leftover yarn I now have almost an entire new skein of pink yarn, but don't worry I already have a project in mind to use it up. 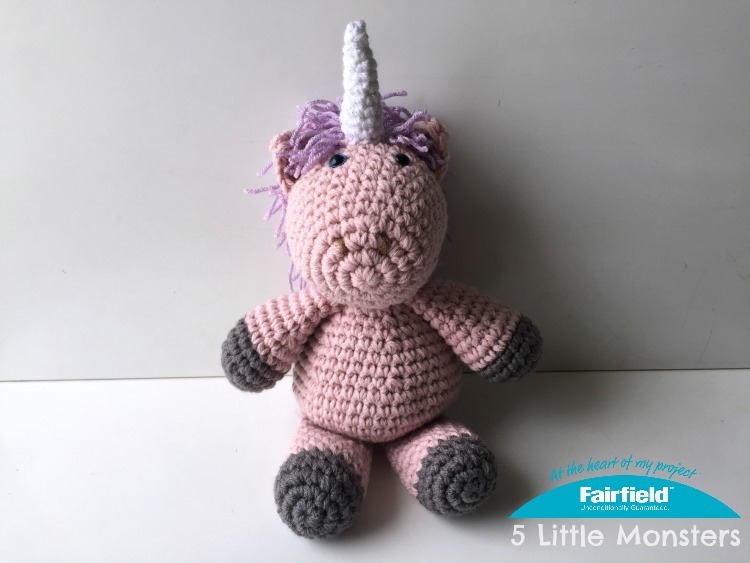 You can find the pattern to make your own Crocheted Unicorn on the Fairfield World website.